Complement activation products are elevated in the cerebrospinal fluid and spinal cord of patients with amyotrophic lateral sclerosis (ALS). In this study, we demonstrate complement system involvement in a rodent model of ALS (human SOD1G93A transgenic rats). With end-stage disease, SOD1G93A rats displayed marked deposition of C3/C3b, and a significant up-regulation of the C5aR in the lumbar spinal cord. This was associated with increased numbers of C5aR-positive astrocytes. However, expression of C5L2, the alternative receptor for C5a, was highest on motor neurons early in the disease process. To determine the contribution of C5a to the pathology displayed by this model of ALS, rats were administered an orally active, selective C5aR antagonist (PMX205; 1 mg/kg/day, oral). 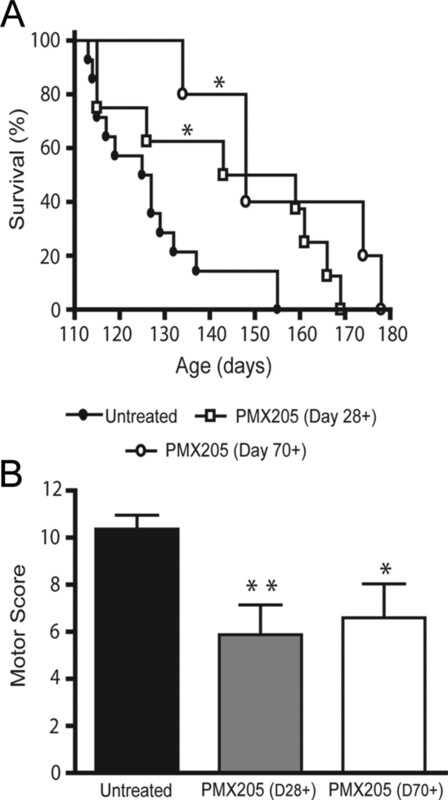 Animals treated with PMX205 displayed a significant extension of survival time and a reduction in end-stage motor scores, as compared with vehicle-treated rats. PMX205-treated animals also displayed reduced levels of astroglial proliferation in the lumbar spinal cord. This study provides the first demonstration of an involvement of C5a in an ALS model and suggests that inhibitors of complement activation could be beneficial in the treatment of this neurodegenerative disease. Amyotrophic lateral sclerosis (ALS),3 the most common form of motor neuron disease, is a fatal neurodegenerative disorder characterized by a progressive loss of both upper and lower motor neurons, leading to paralysis and eventual death (1). Several lines of evidence indicate that there is a significant contribution of immune and inflammatory components to ALS pathology. These include the presence of reactive microglia and astrocytes, infiltration of T lymphocytes, and up-regulation of cyclooxygenase 2 and PGE2 in the spinal cord of ALS patients (2, 3, 4). The classical complement system is also implicated in ALS pathophysiology. Activation fragments of the complement components C3 and C4 are increased in the serum and cerebrospinal fluid of ALS patients (5, 6, 7). Elevated levels of these fragments are also localized to glia in the spinal cord and motor cortex of ALS patients (6, 8). Similarly, C1qB mRNA is elevated in these brain regions in ALS patients (9). Although the majority (∼90%) of ALS cases are sporadic, a proportion of familial onset cases are due to missense mutations in the copper-zinc superoxide dismutase 1 (SOD1) enzyme. This discovery led to the development of transgenic animal models of ALS expressing multiple copies of this mutant human SOD1 gene (10, 11, 12). Recently, three independent studies have reported increases in the classical complement component C1q in spinal cord tissue (13) or isolated motor neurons (14, 15) in transgenic mouse models of ALS. Although these studies suggest a role for the complement system in transgenic ALS models, the involvement of specific complement factors in the progression of ALS pathology has not yet been determined. The complement factor C5a is a major effector of all complement activation pathways and recruits and activates inflammatory cells, creating profound immunoinflammatory sequelae (16). C5a is also produced locally in the CNS and the C5aR (CD88) is present on neurons and glia (17). Consistent with its presence in the CNS, this anaphylatoxin is implicated in the pathology of neurodegenerative diseases in vivo (17, 18). C5a also binds to another recently described receptor, the C5a-like receptor 2 (C5L2; GPR77) (19). This receptor was originally thought to function as a decoy receptor, as it did not appear to be linked to the activation of any intracellular signaling pathways (19, 20, 21). However, some recent studies suggest that C5L2 is in fact functional and is involved in C5a signaling (22, 23). In the present study, we examined complement factor expression in transgenic SOD1G93A rats. We found significant deposition of complement factor C3/C3b and an up-regulation of the C5aR and C5L2 in the diseased spinal cord. We then used a potent and selective C5aR antagonist (PMX205) that we had previously found to reduce striatal neurodegeneration in 3-nitropropionic acid intoxication in rats (18). Chronic oral administration of PMX205 to SOD1G93A transgenic rats significantly reduced end-stage (ES) motor-deficit scores and enhanced survival times. This was also associated with reduced astroglial proliferation in the regions of motor neuron degeneration. These studies demonstrate that activation of complement and C5aRs are involved in the progression of disease pathology in transgenic SOD1G93A rats. Transgenic SOD1G93A rats expressing human mutant G93A SOD1 (NTac:SD-Tg SOD1G93A L26H) (12) were originally obtained from Taconic Farms. It has previously been shown that there is significant sexual dimorphism in SOD1G93A rats, with males having an earlier disease onset than females (24). In our hands, male rats also demonstrated a more consistent disease phenotype (data not shown), as a result of which we only examined male animals. All animal experimental procedures were performed in accordance with guidelines from the National Health and Medical Research Council of Australia and were approved by the University of Queensland Animal Ethics Committee. Initially, we examined the expression of complement factors (C3/C3b, the C5aR and C5L2) in the spinal cord in a group of SOD1G93A rats and their wild-type (WT) littermates. Spinal cords were removed from SOD1G93A rats at either day 90 (presymptomatic (PS)) or at the ethical point of euthanasia (deemed to be ES) and from age-matched WT littermates. ES was defined as when rats reached a maximal righting reflex score (see below; score = 12), or had lost >20% of their peak body weight (12). Tissues were processed using RT-PCR, Western blotting, and immunohistochemistry as described below. Following this, in a separate group of experiments, we examined whether blocking the C5aR with the selective C5aR antagonist PMX205 would provide protective effects in SOD1G93A rats. PMX205 (hydrocinnamate-[OP(D-Cha)WR]) was synthesized as previously described (25). Three experimental groups were chosen: untreated, PMX205 treated from day 28 onward, and PMX205 treated from day 70 onward. Animals were administered PMX205 via drinking water (1 mg/kg/day) (26), from day 28 or day 70 onward; controls received water only. In our preliminary experiments, we observed two different SOD1G93A phenotypes: fore limb paralysis and hind limb paralysis. The fore limb paralysis phenotype occurred in ∼25% of the SOD1G93A rats and resulted in a more aggressive disease course, with an earlier and more variable disease onset and faster progression (motor-deficit duration: 3.1 ± 1.4 days; n = 8), in concordance with other studies (27, 28). In our current studies, we excluded rats displaying the altered phenotype of fore limb onset, since these variables may have confounded the interpretation of our data (27). To evaluate the disease course in the SOD1G93A rats, we measured body weight and performed a motor function test, a combination which reliably identifies disease onset and progression and correlates with motor neuron loss (27). Motor function was determined using a modified motor scale (12, 27). Rats were scored on degree of hind limb movement deficits (0–3 per hind limb; ranging from no deficit (score 0) to complete limb paralysis (score 3)), gait abnormalities (0–2; normal gait (score 0), abnormal gait (score 2)), and righting reflex (0–4; time to right itself when placed on back −0 s (unable to place on back, score 0), <1 s (score 1), <5 s (score 2), 5–10 s (score 3), >10 s (score 4)). Motor scores were combined to give a maximal total score of 12 for severe disease. Disease onset was determined by initial loss of body weight (age of peak body weight), and motor onset was determined as the onset of motor score of 2 or above (28). Animals were euthanized (deemed to be ES) when they reached a maximal righting reflex score (score = 12) or when they had lost >20% of their peak body weight (12). Abs against rat C5L2 were raised in rabbits by immunization of the extracellular N-terminal sequence of rat C5L2 (MLNDTTSKDYEYEYDQEQYSDLLNVPVDC) coupled to keyhole limpet hemocyanin. Affinity-purified Abs were then produced from antiserum fractions on a C5L2 N-terminal peptide-conjugated AF-Tresyl Toyoperl gel column. This C5L2 Ab recognized RBL cells transfected with rat C5L2, but not untransfected control cells. Furthermore, binding to rat C5L2-transfected RBL cells was totally inhibited by preincubation of the C5L2 Ab with immunizing peptide at 100 μg/ml. In our Western blotting experiments using this Ab, we visualized one intense immunoreactive band at ∼45 kDa. Animals were perfused with 2% sodium nitrite solution (in 0.1 M phosphate buffer, pH 7.4), followed by a 4% formaldehyde solution (pH 7.4 in phosphate buffer; 4°C), freshly prepared from paraformaldehyde powder. Excised spinal cords were then processed for cryosectioning and lumbar spinal cords were cut into 16-μm-thick transverse sections. Sections were blocked (3% BSA or goat serum in PBS) for 30 min, then incubated overnight at 4°C with appropriate primary Abs: mouse anti-rat C3/C3b (1/100; Hycult Biotechnology), mouse anti-rat C5aR (clone R63, 1/500; Hycult Biotechnology), rabbit anti-rat C5L2 (8 μg/ml), mouse anti-human glial fibrillary acidic protein (GFAP mixture 1/1000; BD Biosciences Pharmingen), or rabbit anti-human Iba1 (1/600; Biocare Medical). In certain sections, IgG-negative controls (rabbit IgG; DakoCytomation and mouse IgG2a; Serotec) were used in place of primary Abs to determine nonspecific background staining. Biotinylated goat anti-mouse or rabbit secondary Abs (Vector Laboratories) were then added (1/250) for 2 h at room temperature before addition of ABC reagent (Vectastain ABC Elite Kit; Vector Laboratories) for 1 h. Immunostaining was then visualized with 3,3′-diaminobenzidine. Where appropriate, the intensity of 3,3′-diaminobenzidine immunostaining was quantified using image analysis software (Zeiss AxioVision 4.5). Four sections from each rat, at least 200 μm apart, were processed in a blinded fashion based on the degree of specific staining intensity in the ventral lumbar region. Lower staining limits were set based on background staining from negative controls. All sections undergoing these analyses were run in the same experiment using the same conditions and photographs were taken using the same exposure settings. This allowed for a relative comparison of staining intensities between animals. Fluorescence double labeling was performed on separate sections to localize the expression of C5aR or C5L2 (see above Abs) along with a specific cell type marker. These included the following: for astrocytes, we used a rabbit anti-porcine GFAP (1/500; Chemicon International) or a mouse anti-human GFAP mixture (1/1000; BD Pharmingen); for microglia, we used a rabbit anti-human Iba1 (1/600; Biocare Medical) or mouse anti-rat CD11b (OX42, 1/100; Serotec); and for motor neurons, we used either a mouse anti-rat unphosphorylated neurofilament (SMI-32, 1/500; Abcam) or a goat anti-choline acetyltransferase (anti-ChAT, 1/200; Chemicon International). These primary Abs were detected using Alexa Fluor 555 goat anti-mouse (1/1000), Alexa Fluor 488 goat anti-rabbit (1/600; Invitrogen), or Alexa Fluor 488 donkey anti-goat (1/300; Jackson ImmunoResearch Laboratories) Abs. In the case of C5aR detection, we first used a biotinylated goat anti-mouse Ab (1/300, Vector Laboratories) followed by Alexa Fluor 555-streptavidin conjugate (1/600, Invitrogen) in place of the Alexa Fluor 555 goat anti-mouse Ab. All primary Abs were incubated overnight at 4°C and secondary Abs were incubated for 2 h at room temperature. IgG-negative controls were also included to determine nonspecific background staining. Following staining, all sections were mounted in antifade medium (ProLong Gold; Invitrogen). In a subset of these double-labeled sections, we determined in a 200-μm2 field the proportion of GFAP-positive astrocytes that expressed the C5aR in the ventral lumbar spinal cord of WT, PS, and ES SOD1G93A rats. This was performed blind and was repeated for a biological n of 3 (i.e., three rats from each group). Spinal cord homogenates were separated by electrophoresis on a 10% SDS-polyacrylamide gel and transferred to a polyvinylidene difluoride membrane (Bio-Rad). Following blocking, the membranes were incubated overnight at 4°C with appropriate Abs (mouse anti-rat C5aR (1/500; Hycult Biotechnology) or rabbit anti-rat C5L2 (1.6 μg/ml)). Goat anti-mouse or goat anti-rabbit HRP was then added for 2 h at room temperature. Immunoblot bands were visualized by ECL chemiluminescence and Hyperfilm ECL (Amersham). As a loading control, blots were stripped and re-robed for β-actin (1/15,000; Chemicon International) or GAPDH (1/10,000; Novus Biologics). To quantify differences in complement protein expression between WT and SOD1G93A rats, homogenates from one WT, one PS SOD1G93A, and one ES SOD1G93A rat were run together on one blot (i.e., one biological set per blot, n = 1). This was repeated for three to four biological sets (n = 3–4). NIH ImageJ 1.31v software was then used for quantitation of immunoblot band intensity and area, normalized to the loading control band (β-actin or GAPDH), and calculated as integrated pixel intensity values. These values were then expressed as relative changes in the density ratios normalized to the WT band ratio in each separate blot (expressed as mean ± SEM). RNA was extracted from spinal cords of SOD1G93A and control rats according to the manufacturer’s instructions for TRIzol Reagent (Invitrogen). RT-PCR was then conducted as previously described (29) using sense (5′- GGACCCCATAAGTAACGACA-3′) and antisense (5′-TAGCCAGAACACAAAGAAAC-3′) C5aR primers (Geneworks) with loading accuracy determined through RT-PCR for GAPDH transcript. All data were analyzed using Prism 5.01 software (GraphPad Software), and where appropriate presented as the mean ± SEM. Kaplan-Meier survival curves were compared using the log rank test. A nonparametric t test (Mann-Whitney U test) was used to compare motor scores; otherwise, Student’s t test was used. Significance was determined as p < 0.05. We initially examined the complement pathway factor C3, and its activation fragment C3b, in SOD1G93A transgenic rats and their WT littermates due to its pivotal locus in the complement cascade and its up-regulation in human ALS patients (5, 6, 7, 8). We observed increased immunolabeling for C3/C3b in the spinal cord of ES SOD1G93A rats, compared with WT animals (Fig. 1⇓, A and B). C3/C3b deposition appeared primarily in the ventral lumbar spinal cord, around areas of motor neurons, indicating activation of complement in the area of motor neuron degeneration. C3/C3b immunolabeling in ES SOD1G93A rats was significantly up-regulated (7.6-fold increase compared with WT rats. p = 0.026. n = 4; Fig. 1⇓C). Complement C3/C3b deposition and up-regulation in diseased SOD1G93A transgenic rats. A and B, Immunolabeling for C3/C3b in the ventral lumbar spinal cord of a WT (A) and a paralyzed, ES SOD1G93A (B) rat. Increased deposition of C3/C3b was seen in ES SOD1G93A rats. The degree of immunolabeling was quantified over multiple sections using image analysis software (C), which showed a significant increase (7.6-fold) in C3/C3b immunolabeling in ES SOD1G93A rats compared with their WT littermates (*, p = 0.026; n = 4). Data in C represent the mean ± SEM. Bar, 100 μm. Immunolabeling was initially performed for the C5aR in the lumbar spinal cord of WT rats. We found C5aRs present on the somas of motor neurons located within the ventral horn of the spinal cord (Fig. 2⇓, A and B; Ref. 30). This was confirmed by double-immunolabeling sections with an Ab to choline acetyltransferase, a cholinergic neuronal marker that identified these cells as motor neurons (Fig. 2⇓, C–E). By contrast, there was minimal C5aR immunolabeling of astrocytes and microglia within this region of the spinal cord of WT rats (see Figs. 2⇓A, 3⇓C, and 4⇓A). C5aR expression on ventral lumbar motor neurons. Shown are representative lumbar spinal cord sections from a WT rat. Strong immunostaining for the C5aR was seen on lumbar motor neurons (A). Expression of the C5aR was most obvious in the neuronal cell soma (arrows, B). This was confirmed by double immunolabeling using an Ab against ChAT, a marker for cholinergic motor neurons (C5aR, C; ChAT, D, merge, E). Box in A indicates the high-power view in B. Bar: A, 100 μm; B, 25 μm; and C–E, 20 μm. C5aR expression on motor neurons and astrocytes in SOD1G93A rats. A–I. The expression of the C5aR (red) and GFAP (green) in the ventral lumbar spinal cord of WT (A–C), PS SOD1G93A (D–F), and paralyzed, ES SOD1G93A (G–I) rats. C5aRs are localized on lumbar motor neurons (arrows; B, E, and H). There was also increased expression of the C5aR in ES spinal cords (H), with strong colocalization to GFAP-labeled astrocytes (yellow; I). By contrast, there was little expression of C5aRs on astrocytes in PS (F) or WT (C) astrocytes. Bar, 50 μm. Lack of C5aR colocalization to microglia in SOD1G93A rats. Shown are representative sections from the ventral lumbar spinal cord of WT (A) and paralyzed ES SOD1G93A (B) rats stained for the C5aR (red) and microglia (Iba1; green). 4′,6-diamidino-2-phenylindole (blue) was used for nuclear staining. Despite the large increase in Iba1 immunolabeling in the ES SOD1G93A animals (indicating microglial proliferation), no colocalization is seen with C5aR. Bar, 50 μm. Following this demonstration of C5aRs in WT spinal cord, we next aimed to identify any changes in expression in our transgenic model. First, we examined changes in the expression and cellular localization of the C5aR in the lumbar spinal cord during disease progression using immunofluorescence techniques. C5aRs were present on motor neurons of WT (Fig. 3⇑B) and PS SOD1G93A transgenic rats (Fig. 3⇑E). Similarly, C5aRs were still present on the few remaining motor neurons seen at the ES of ALS pathology (Fig. 3⇑H). Using the astrocytic marker GFAP, we demonstrated that there was a recruitment of astrocytes to areas of motor neuron loss. This recruitment was most evident within the lumbar spinal cord of ES animals (Fig. 3⇑, A, D, and G), confirming the findings of a previous study (12). Furthermore, there was an increased colocalization of C5aRs and GFAP in astrocytes within the lumbar spinal cord of ES rats (Fig. 3⇑, cf C and F with I). In WT animals, ∼6% of GFAP-positive astrocytes expressed C5aRs (9.7 ± 2.1 cells/150 cells counted in a 200-μm2 area, n = 3). A similar figure (∼5%) was obtained in PS SOD1G93A rats (8.2 ± 3.2 cells/150 cells, n = 3). However by ES disease, there was a dramatic increase (∼63%) in the number of GFAP-positive astrocytes expressing the C5aR (95.0 ± 9.8 cells/150 cells, n = 3; p = 0.001 vs WT). We also examined the degree of colocalization of the C5aR with microglia using the marker Iba-1. 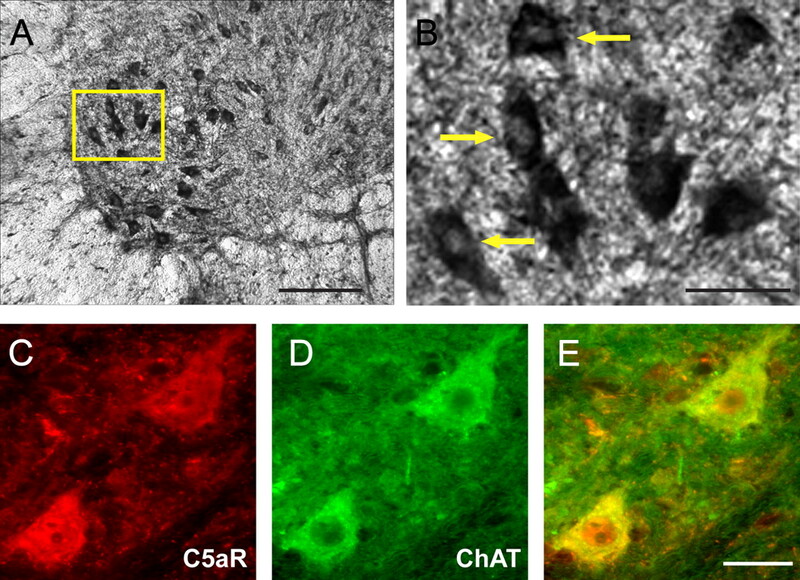 Few C5aR-positive microglial cells were observed in the ventral lumbar spinal cord of WT animals (Fig. 4⇑A). Furthermore, although recruitment of Iba-1-positive microglia to sites of neuronal injury was increased in diseased SOD1G93A rats, as reported by others (31), these microglia did not express C5aRs (Fig. 4⇑B). Finally, we examined the expression of C5aR mRNA and protein in both WT and SOD1G93A rats to corroborate our immunohistochemistry data. There was an increase in spinal cord C5aR mRNA transcript in both PS and ES SOD1G93A rats compared with WT controls (Fig. 5⇓A). C5aR protein was also increased in SOD1G93A rats, but only in ES animals (∼8-fold increase, p = 0.038; Fig. 5⇓, B and C), demonstrating that up-regulation of C5aR mRNA transcript preceded that of its protein. Increasing expression of the C5aR with progressive motor neuron disease severity in SOD1G93A rats. C5aR mRNA and protein were measured in the lumbar spinal cord of WT, PS SOD1G93A, and paralyzed ES SOD1G93A rats. The C5aR mRNA level in PS and ES lumbar spinal cords was higher than that in control tissue (A). No specific bands were detected in any RT-negative samples (−). Liver (L) and water (W) were used as positive and negative controls, respectively, and GAPDH mRNA was consistent in all samples (A). 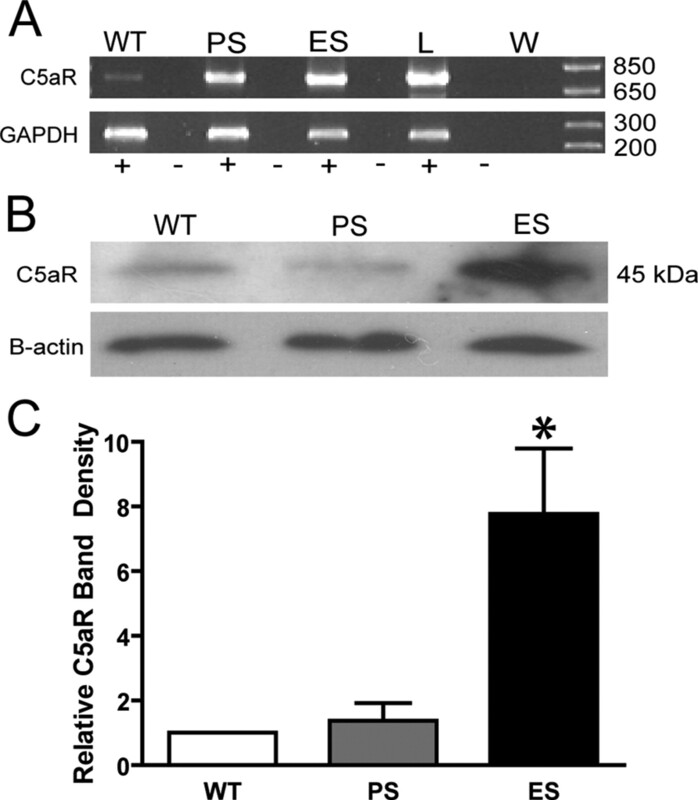 Higher C5aR protein expression was seen in ES spinal cords than in WT and PS tissue (B). β-Actin staining showed equal protein loading among samples (B). These changes in C5aR protein expression were quantified by densitometry, demonstrating a significant increase in the C5aR in ES rats (C; *, p = 0.027, n = 3). Data in C represent the mean ± SEM. The expression and localization of the second receptor for C5a, C5L2, was examined in WT and SOD1G93A rats using an Ab directed toward the N-terminal peptide sequence of rat C5L2. Immunolabeling revealed that C5L2 was most apparent on motor neurons (Fig. 6⇓, A–C). This was confirmed with colocalization to unphosphorylated neurofilament (SMI-32; Fig. 6⇓D). By contrast to WT and PS SOD1G93A rats, overall C5L2 immunolabeling was decreased within the lumbar spinal cord of ES SOD1G93A animals, in line with reduced motor neuron numbers in these animals. Immunolabeling for C5L2 was not present on microglia or astrocytes as determined by colocalization with CD11b or GFAP (data not shown). Expression of C5L2 on motor neurons in WT and SOD1G93A rats. Immunolabeling was performed for C5L2 in the lumbar spinal cord of WT (A), PS SOD1G93A (B), and paralyzed ES SOD1G93A (C) rats. C5L2 appeared primarily on motor neurons (arrows; A–C) and was confirmed with colocalization with unphosphorylated neurofilament (SMI-32; D). Overall, C5L2 immunolabeling in the ventral lumbar spinal cord was reduced in ES animals, as motor neuron numbers decreased (C). Protein for C5L2 was also determined in the lumbar spinal cord using Western blot which supported the expression seen with immunolabeling (E). Namely, there appeared to be a slight increase in PS animals, with a significant decrease by ES, when analyzed by densitometry (F; **, p = 0.004, n = 4). Data in F represent the mean ± SEM. Bar, 50 μm. We also determined spinal cord levels of C5L2 protein by Western blot. C5L2 protein was detected in the spinal cords of WT and SOD1G93A rats (Fig. 6⇑E). A single intense immunoband was visualized at ∼45 kDa, which is the previously published size of the native glycosylated form of C5L2 (32). A second fainter immunoband was located at ∼37 kDa, which is the predicted size of C5L2 based purely on protein sequence (the nonglycosylated form). Although there appeared to be an increase in C5L2 protein in PS SOD1G93A rats, a significant reduction in C5L2 protein was seen within the lumbar spinal cord of ES animals (∼55% reduction, p = 0.004; Fig. 6⇑F), consistent with our immunohistochemical data. SOD1G93A rats were orally dosed with the selective C5aR antagonist PMX205 (1 mg/kg/day) from two time points (days 28 and 70) before the onset of major clinical symptoms. Both treatment groups had a significant extension in survival time compared with untreated rats (p = 0.022, day 28; p = 0.015, day 70; Fig. 7⇓A), with no clear differences in outcomes between the two treatment regimens. Animals were also examined for signs of motor deficits following the onset of disease (Fig. 7⇓B). Motor-deficit scores were based on hind limb weakness and paralysis, as this has been shown to be a reliable indicator of motor neuron loss (27). Motor-deficit scores were maximal or near maximal in ∼80% of untreated SOD1G93A rats at the point of euthanasia. By contrast, animals treated with PMX205 from either time point (day 28 or day 70) had significantly reduced motor deficits (p = 0.002, day 28; p = 0.011, day 70; Fig. 7⇓B) compared with untreated SOD1G93A rats at the point of euthanasia. Extension of survival time and reduction in motor deficits in SOD1G93A rats following C5aR antagonist treatment. Rats transgenic for human SOD1G93A were orally dosed with the C5aR antagonist PMX205 from either 28 (day 28+) or 70 (day 70+) days of age (1 mg/kg/day). Drug treatment from either time point resulted in a significant extension in survival time (A) compared with untreated rats. Terminal motor scores (B) were also significantly reduced in drug-treated rats compared with untreated rats. Data in B represent the mean ± SEM. *, p < 0.05 and **, p < 0.01 vs untreated group (A, log rank and B, Mann-Whitney U test; n = 5–14). Drug treatment also significantly delayed the onset of the disease, as defined by initial body weight loss from peak body weight (p = 0.035, day 28; p = 0.011, day 70; Table I⇓). Motor symptom onset was also significantly delayed in drug-treated SOD1G93A rats (p = 0.019, day 28; p = 0.008, day 70; Table I⇓). In addition, the time to motor symptom onset from disease onset was extended in PMX205-treated rats by 4–7 days (see Table I⇓). We found a significant recruitment of astrocytes and microglia to the lumbar spinal cord of ES SOD1G93A rats, as compared with WT animals (astrocytes: 34-fold increase, n = 4; microglia: 21-fold increase, n = 4; Fig. 8⇓, A–D). In SOD1G93A rats treated from day 28 with PMX205, there was a significant reduction in astrocyte immunolabeling at the end stage of disease (47% reduction, p = 0.044, n = 5; Fig. 8⇓G), as compared with that seen in untreated SOD1G93A rats (cf Fig. 8⇓, E with C). By contrast, microglial proliferation was not affected by treatment with PMX205 (p = 0.68, n = 5; Fig. 8⇓H). Reduction of astrocyte, but not microglial, proliferation in SOD1G93A rats following C5aR antagonist treatment. Shown are representative ventral lumbar spinal cord sections from WT, ES SOD1G93A, and ES SOD1G93A rats treated with the C5aR antagonist PMX205 from day 28 (1 mg/kg/day) (ES PMX205). 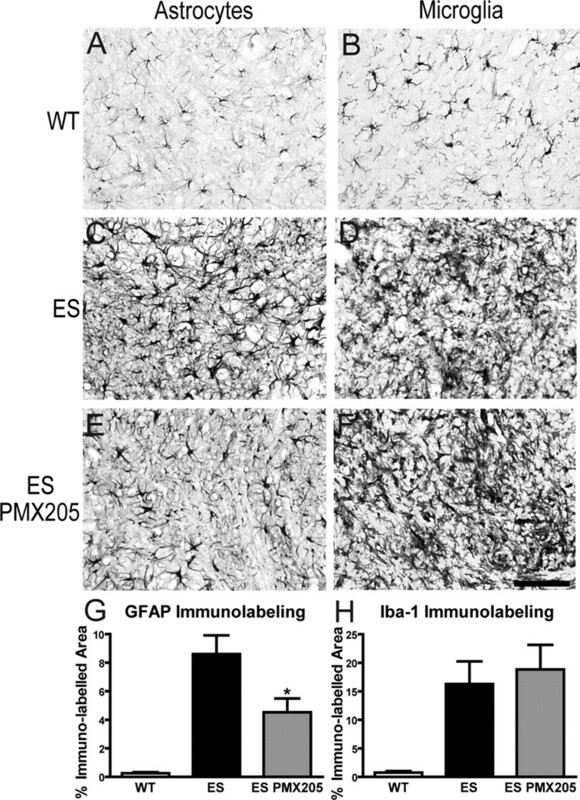 Sections were immunolabeled with GFAP and Iba-1 to identify astrocytes and microglia, respectively. 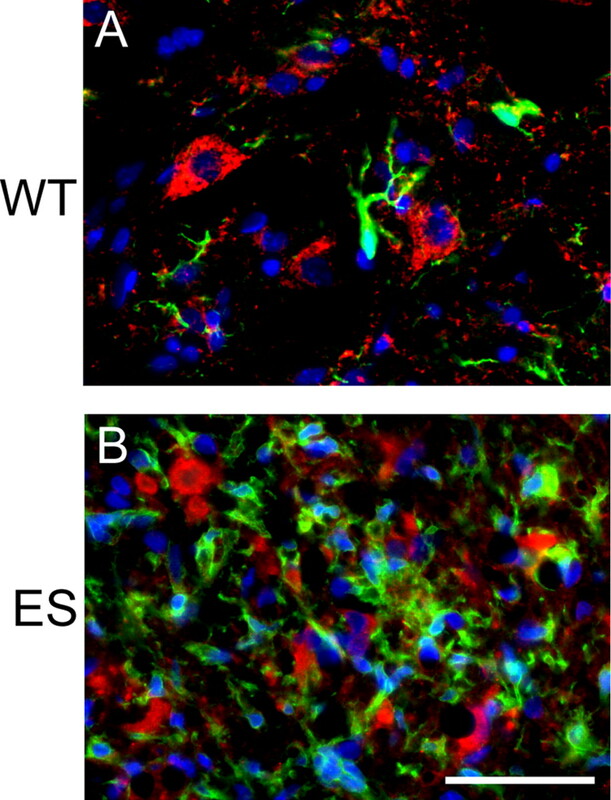 The number of both astrocytes and microglia was considerably increased in ES SOD1G93A rats (C and D) compared with WT animals (A and B). Rats treated with the C5aR antagonist PMX205 from day 28 (1 mg/kg/day) showed a reduction in astrocytes (E), but not microglia (F). The degree of immunolabeling was quantified over several sections using image analysis software (G and H), which showed a significant reduction in GFAP immunolabeling in ES, PMX205-treated SOD1G93A rats (G; *, p = 0.044; n = 5), but no reduction in Iba1 immunolabeling (H; p = 0.68; n = 5) compared with that in untreated ES SOD1G93A rats. Data in G and H represent the mean ± SEM. Bar, 100 μm. Currently, there is no effective treatment for ALS. Although the pathogenesis of this condition is poorly understood, there is persuasive evidence that complement factors are involved (5, 6, 7, 8, 9). Given that C1q mRNA expression is significantly increased in mouse models of ALS (13, 14, 15), we sought to determine the involvement of complement factors in the rat SOD1G93A transgenic model of the disease. Our findings demonstrate that complement factors and their receptors are indeed up-regulated during the course of disease progression in SOD1-transgenic rats. Furthermore, we report that oral administration of a specific C5aR antagonist extends survival times and delays the onset of motor deficits in this rat model. In the present study, the levels of complement factor C3, and its activation fragment C3b, were increased within the lumbar spinal cord of SOD1G93A rats. This demonstrates that complement activation does occur within close proximity to motor neurons in these animals. This adds further support to the suggestion that complement activation plays a role in motor neuron loss and, as such, in the progression of ALS. Somewhat surprisingly, the C5aR was found to be strongly expressed on WT motor neurons. C5aR mRNA has previously been demonstrated in motor neurons of WT mice (33). Our further demonstration of C5aR protein specifically on these cells suggests that the C5aR may serve an as yet undetermined role in normal motor neuron function. Regardless, C5aR protein was significantly increased within the spinal cord of ES SOD1G93A rats and was localized to motor neurons and proliferating astrocytes. In concordance with the notion that C5a contributes to pathogenic processes within the CNS, we have previously demonstrated C5aR up-regulation on degenerating striatal neurons in an acute model of Huntington’s disease (18). 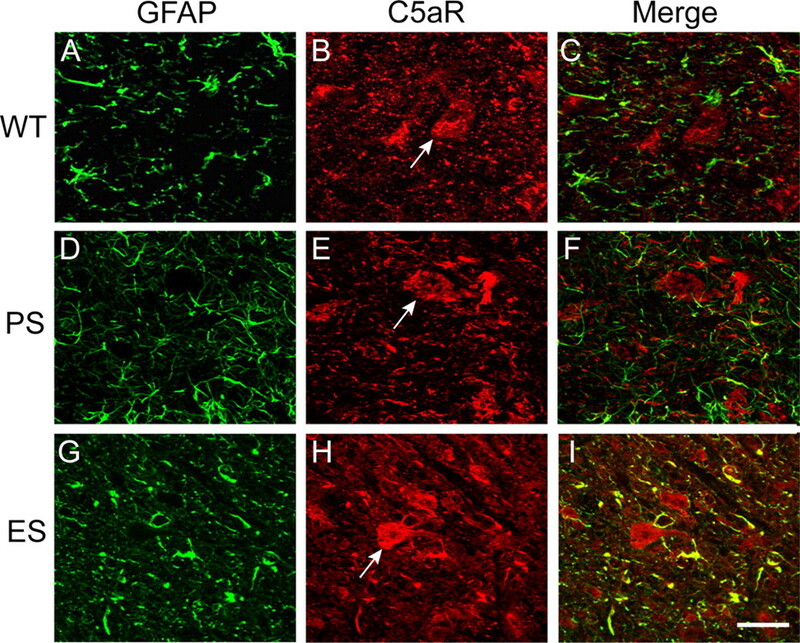 Given that C3/C3b up-regulation occurs in these SOD1-transgenic rodents (indicating increased complement activation in the lumbar spinal cord), locally produced C5a could be interacting with C5aR-expressing motor neurons and astrocytes of ALS animals. Indeed, other studies have shown that many complement factors and their receptors can be synthesized by both neurons and glia in the CNS (17). Although there is breakdown of the blood-brain barrier in the end stages of ALS (34, 35), the accumulating evidence for abundant local complement expression in many cell types in the CNS may indicate that this provides a local microenvironment for exacerbating ALS pathology compared with that provided by infiltration of systemic complement factors. The role played by C5L2 (the second receptor for C5a to be identified) in various complement-mediated diseases is controversial. C5L2 is uncoupled from G proteins and may act as a decoy receptor, mopping up excess C5a to limit its effects (19, 20, 21). However, recent evidence suggests a more complex role for C5L2, including interactions with the C5aR and a potential functional role (22, 23). Our results demonstrate that C5L2, like the C5aR, is constitutively present on motor neurons. In SOD1G93A rats, C5L2 significantly decreased with ES disease progression, in line with decreasing motor neuron presence. The results of the present study do not clearly demonstrate whether C5L2 (either alone or in combination with C5aRs) plays a role in the pathogenesis of ALS. However, its differential expression on WT and SOD1G93A motor neurons certainly provides impetus for further examination of its possible role in ALS. To determine whether complement deposition (along with the associated local production of C5a) and the up-regulation of the C5aR in the lumbar spinal cord of SOD1- transgenic rats were contributing to disease progression, we inhibited C5aR activation with the C5aR-selective antagonist PMX205. This orally active compound (25) crosses the blood-brain barrier and has been shown to have a protective effect in an acute model of striatal degeneration (18). Furthermore, PMX205 displays little detectable affinity for C5L2 (36). The results of our experiments using this drug were striking. Treatment with PMX205 significantly extended survival time and delayed the onset of motor dysfunction in SOD1G93A rats. Motor-deficit scores measured at the point of euthanasia were also reduced by up to 40% in rats treated with this C5aR antagonist. From these results, it is clear that C5aR activation contributes to the pathogenesis seen in this model of ALS. Our drug-treated experiments included rats dosed from a very early age (day 28) to determine the maximum effect of C5aR inhibition, as well as at a later point in adult rats, just before initial motor neuron loss (day 70) (27). Our results show that there were no significant differences in either survival time extension or reduction in motor scores between the two dosing groups, suggesting that the pathogenic involvement of C5a occurs subsequent to day 70. This is in agreement with the late appearance of C5aR up-regulation in ES SOD1G93A rats, indicating that C5a exacerbates pathology, but does not initiate the onset of disease. The onset of observable clinical disease (∼110 days) in our experiments agrees well with other recently published studies (27, 37). However, it has been reported that initial motor neuron loss and early muscle dysfunction occurs well before observable disease onset, around 80 days of age (27) and, as such, we dosed animals just before this initial loss of motor neurons. Although our results indicate that C5a contributes to pathology in this model, future studies are required to determine whether inhibition of C5a later in the disease process, once motor neuron loss has clearly occurred, could also provide therapeutic benefits which would more closely model a therapeutic intervention for human ALS patients. In the present study, C5aR expression on astrocytes increased with disease progression. This suggests that at least some of the therapeutic benefits seen with C5aR antagonism are due to a reduction of C5a-mediated activation of astrocytes. Astrocytes are thought to be a contributor to the pathology observed in SOD1 ALS models (38, 39, 40). Astrocytes derived from SOD1-transgenic mice release an, as yet unidentified, toxic factor that induces motor neuron cell death (41). The idea that astrocytes, activated by C5a, release factors contributing to cell death seems worthy of investigation. In support of this hypothesis, PMX205-treated rats displayed a significant reduction in astrogliosis within the spinal cord at the end stage of the disease. By contrast, C5aRs were not present on microglia within the lumbar spinal cord of either WT or SOD1G93A rats. This was a surprising finding, but is consistent with the observation that PMX205 treatment does not alter microglial proliferation seen within the lumbar spinal cord at the end stage of disease. We have previously shown that PMX205 reduces C5a-mediated pathology in several inflammatory models (25), including an acute model of Huntington’s disease (18). The present study provides compelling evidence that the complement system and, in particular C5a, is involved in the disease progression seen in our rat model of ALS. Oral administration of PMX205 to SOD1G93A rats had unambiguous ameliorative effects on motor dysfunction and also extended survival time. As such, we suggest that inhibitors of C5a may have therapeutic potential in neurodegenerative diseases such as ALS, in which inflammation is implicated. We thank Promics (Arana Therapeutics) for supplying C5aR antagonist for this study. We also sincerely thank Prof. Surindar Cheema for donating the SOD1G93A transgenic rat colony for our experimental use and the Integrative Neuroscience Facility, Howard Florey Institute, for additional rat tissues and acknowledge Wyeth and the Amyotrophic Lateral Sclerosis Association for making these animals originally available through Taconic Farms. S.M.T. was the Scientific Director and CSO (2001–2006) of Promics. T.M.W. was a scientific consultant to Promics/Arana Therapeutics (2003–2007). Neither has any current association or financial ties with either company. ↵1 This work was supported by Grants-in-Aid from the Motor Neuron Disease Research Institute of Australia (to T.M.W., P.G.N., and S.M.T. ), a Project Grant from the National Health and Medical Research Council of Australia (Grant 455856 to S.M.T. and P.G.N. ), and a Wellcome Trust project grant, UK (Grant 072231 to P.N.M.). ↵3 Abbreviations used in this paper: ALS, amyotrophic lateral sclerosis; C5L2, C5a-like receptor 2; GFAP, glial fibrillary acidic protein; ChAT, choline acetyltransferase; SOD1, copper–zinc superoxide dismutase; WT, wild type; ES, end stage; PS, presymptomatic. Mitchell, J. D., G. D. Borasio. 2007. Amyotrophic lateral sclerosis. Lancet 369: 2031-2041. Almer, G., C. Guegan, P. Teismann, A. Naini, G. Rosoklija, A. P. Hays, C. Chen, S. Przedborski. 2001. Increased expression of the pro-inflammatory enzyme cyclooxygenase-2 in amyotrophic lateral sclerosis. Ann. Neurol. 49: 176-185. Almer, G., P. Teismann, Z. Stevic, J. Halaschek-Wiener, L. Deecke, V. Kostic, S. Przedborski. 2002. Increased levels of the pro-inflammatory prostaglandin PGE2 in CSF from ALS patients. Neurology 58: 1277-1279. McGeer, P. L., E. G. McGeer. 2002. Inflammatory processes in amyotrophic lateral sclerosis. Muscle Nerve 26: 459-470. Annunziata, P., N. Volpi. 1985. High-levels of C3c in the cerebrospinal-fluid from amyotrophic lateral sclerosis patients. Acta Neurol. Scand. 72: 61-64. Tsuboi, Y., T. Yamada. 1994. Increased concentration of C4d complement protein in CSF in amyotrophic lateral sclerosis. J. Neurol. Neurosurg. Psychiatry 57: 859-861. Goldknopf, I. L., E. A. Sheta, J. Bryson, B. Folsom, C. Wilson, J. Duty, A. A. Yen, S. H. Appel. 2006. Complement C3c and related protein biomarkers in amyotrophic lateral sclerosis and Parkinson’s disease. Biochem. Biophys. Res. Commun. 342: 1034-1039. Kawamata, T., H. Akiyama, T. Yamada, P. L. McGeer. 1992. Immunologic reactions in amyotrophic lateral sclerosis brain and spinal cord tissue. Am. J. Pathol. 140: 691-707. Grewal, R. P., T. E. Morgan, C. E. Finch. 1999. C1qB and clusterin mRNA increase in association with neurodegeneration in sporadic amyotrophic lateral sclerosis. Neurosci. Lett. 271: 65-67. Gurney, M. E., H. Pu, A. Y. Chiu, M. C. Dal Canto, C. Y. Polchow, D. D. Alexander, J. Caliendo, A. Hentati, Y. W. Kwon, H. X. Deng, et al 1994. Motor neuron degeneration in mice that express a human Cu,Zn superoxide dismutase mutation. Science 264: 1772-1775. Nagai, M., M. Aoki, I. Miyoshi, M. Kato, P. Pasinelli, N. Kasai, R. H. Brown, Jr, Y. Itoyama. 2001. Rats expressing human cytosolic copper-zinc superoxide dismutase transgenes with amyotrophic lateral sclerosis: associated mutations develop motor neuron disease. J. Neurosci. 21: 9246-9254. Howland, D. S., J. Liu, Y. J. She, B. Goad, N. J. Maragakis, B. Kim, J. Erickson, J. Kulik, L. DeVito, G. Psaltis, L. J. DeGennaro, D. W. Cleveland, J. D. Rothstein. 2002. Focal loss of the glutamate transporter EAAT2 in a transgenic rat model of SOD1 mutant-mediated amyotrophic lateral sclerosis (ALS). Proc. Natl. Acad. Sci. USA 99: 1604-1609. Fukada, Y., K. Yasui, M. Kitayama, K. Doi, T. Nakano, Y. Watanabe, K. Nakashima. 2007. Gene expression analysis of the murine model of amyotrophic lateral sclerosis: studies of the Leu126delTT mutation in SOD1. Brain Res. 1160: 1-10. Lobsiger, C. S., S. Boillee, D. W. Cleveland. 2007. Toxicity from different SOD1 mutants dysregulates the complement system and the neuronal regenerative response in ALS motor neurons. Proc. Natl. Acad. Sci. USA 104: 7319-7326. Ferraiuolo, L., P. R. Heath, H. Holden, P. Kasher, J. Kirby, P. J. Shaw. 2007. Microarray analysis of the cellular pathways involved in the adaptation to and progression of motor neuron injury in the SOD1 G93A mouse model of familial ALS. J. Neurosci. 27: 9201-9219. Guo, R. F., P. A. Ward. 2005. Role of C5a in inflammatory responses. Annu. Rev. Immunol. 23: 821-852. Gasque, P., Y. D. Dean, E. P. McGreal, J. VanBeek, B. P. Morgan. 2000. Complement components of the innate immune system in health and disease in the CNS. Immunopharmacology 49: 171-186. Woodruff, T. M., J. W. Crane, L. M. Proctor, K. M. Buller, A. B. Shek, K. de Vos, S. Pollitt, H. M. Williams, I. A. Shiels, P. N. Monk, S. M. Taylor. 2006. Therapeutic activity of C5a receptor antagonists in a rat model of neurodegeneration. FASEB J. 20: 1407-1417. Cain, S. A., P. N. Monk. 2002. The orphan receptor C5L2 has high affinity binding sites for complement fragments C5a and C5a des-Arg74. J. Biol. Chem. 277: 7165-7169. Okinaga, S., D. Slattery, A. Humbles, Z. Zsengeller, O. Morteau, M. B. Kinrade, R. M. Brodbeck, J. E. Krause, H. R. Choe, N. P. Gerard, C. Gerard. 2003. C5L2, a nonsignaling C5A binding protein. Biochemistry 42: 9406-9415. Gerard, N. P., B. Lu, P. Liu, S. Craig, Y. Fujiwara, S. Okinaga, C. Gerard. 2005. An anti-inflammatory function for the complement anaphylatoxin C5a-binding protein, C5L2. J. Biol. Chem. 280: 39677-39680. Chen, N. J., C. Mirtsos, D. Suh, Y. C. Lu, W. J. Lin, C. McKerlie, T. Lee, H. Baribault, H. Tian, W. C. Yeh. 2007. C5L2 is critical for the biological activities of the anaphylatoxins C5a and C3a. Nature 446: 203-207. Rittirsch, D., M. A. Flierl, B. A. Nadeau, D. E. Day, M. Huber-Lang, C. R. Mackay, F. S. Zetoune, N. P. Gerard, K. Cianflone, J. Kohl, et al 2008. Functional roles for C5a receptors in sepsis. Nat. Med. 14: 551-557. Suzuki, M., C. Tork, B. Shelley, J. McHugh, K. Wallace, S. M. Klein, M. J. Lindstrom, C. N. Svendsen. 2007. Sexual dimorphism in disease onset and progression of a rat model of ALS. Amyotroph. Lateral Scler. 8: 20-25. Woodruff, T. M., S. Pollitt, L. M. Proctor, S. Z. Stocks, H. D. Manthey, H. M. Williams, I. B. Mahadevan, I. A. Shiels, S. M. Taylor. 2005. Increased potency of a novel complement factor 5a receptor antagonist in a rat model of inflammatory bowel disease. J. Pharmacol. Exp. Ther. 314: 811-817. Woodruff, T. M., A. J. Strachan, N. Dryburgh, I. A. Shiels, R. C. Reid, D. P. Fairlie, S. M. Taylor. 2002. Antiarthritic activity of an orally active C5a receptor antagonist against antigen-induced monarticular arthritis in the rat. Arthritis Rheum. 46: 2476-2485. Matsumoto, A., Y. Okada, M. Nakamichi, M. Nakamura, Y. Toyama, G. Sobue, M. Nagai, M. Aoki, Y. Itoyama, H. Okano. 2006. Disease progression of human SOD1G93A transgenic ALS model rats. J. Neurosci. Res. 83: 119-133. Storkebaum, E., D. Lambrechts, M. Dewerchin, M. P. Moreno-Murciano, S. Appelmans, H. Oh, P. Van Damme, B. Rutten, W. Y. Man, M. De Mol, et al 2005. Treatment of motoneuron degeneration by intracerebroventricular delivery of VEGF in a rat model of ALS. Nat. Neurosci. 8: 85-92. Ngo, S. T., C. Balke, W. D. Phillips, P. G. Noakes. 2004. Neuregulin potentiates agrin-induced acetylcholine receptor clustering in myotubes. NeuroReport 15: 2501-2505. Banks, G. B., R. Kanjhan, S. Wiese, M. Kneussel, L. M. Wong, G. O'Sullivan, M. Sendtner, M. C. Bellingham, H. Betz, P. G. Noakes. 2005. 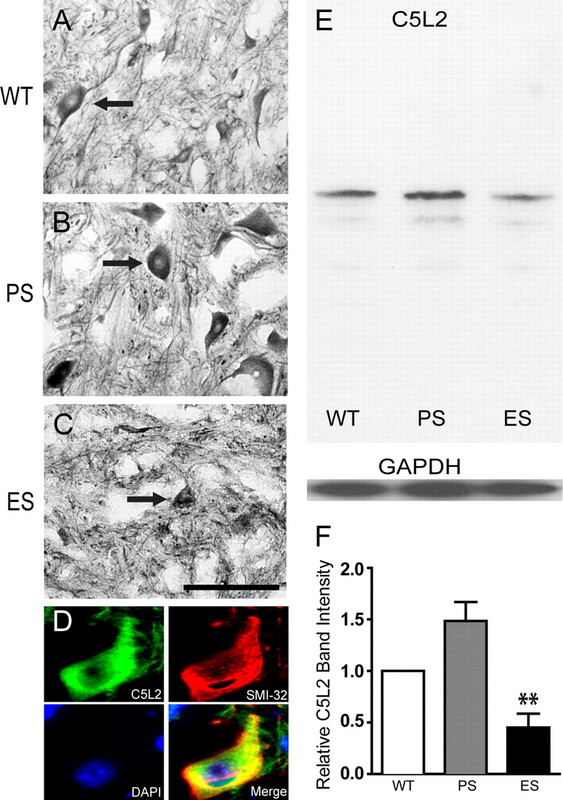 Glycinergic and GABAergic synaptic activity differentially regulate motoneuron survival and skeletal muscle innervation. J. Neurosci. 25: 1249-1259. Huber-Lang, M., J. V. Sarma, D. Rittirsch, H. Schreiber, M. Weiss, M. Flierl, E. Younkin, M. Schneider, H. Suger-Wiedeck, F. Gebhard, et al 2005. Changes in the novel orphan, C5a receptor (C5L2), during experimental sepsis and sepsis in humans. J. Immunol. 174: 1104-1110. Nataf, S., N. Davoust, S. R. Barnum. 1998. Kinetics of anaphylatoxin C5a receptor expression during experimental allergic encephalomyelitis. J. Neuroimmunol. 91: 147-155. Apostolski, S., J. Nikolic, C. Bugarski-Prokopljevic, V. Miletic, S. Pavlovic, S. Filipovic. 1991. Serum and CSF immunological findings in ALS. Acta Neurol. Scand. 83: 96-98. Garbuzova-Davis, S., E. Haller, S. Saporta, I. Kolomey, S. V. Nicosia, P. R. Sanberg. 2007. Ultrastructure of blood-brain barrier and blood-spinal cord barrier in SOD1 mice modeling ALS. Brain Res. 1157: 126-137. Otto, M., H. Hawlisch, P. N. Monk, M. Muller, A. Klos, C. L. Karp, J. Kohl. 2004. C5a mutants are potent antagonists of the C5a receptor (CD88) and of C5L2: position 69 is the locus that determines agonism or antagonism. J. Biol. Chem. 279: 142-151. Xie, Y. H., P. Weydt, D. S. Howland, M. Kliot, T. Moller. 2004. Inflammatory mediators and growth factors in the spinal cord of G93A SODI rats. NeuroReport 15: 2513-2516. Rossi, D., L. Brambilla, C. F. Valori, C. Roncoroni, A. Crugnola, T. Yokota, D. E. Bredesen, A. Volterra. 2008. Focal degeneration of astrocytes in amyotrophic lateral sclerosis. Cell Death Differ. 15: 1691-1700. Knott, A. B., E. Bossy-Wetzel. 2007. ALS: astrocytes take center stage, but must they share the spotlight?. Cell Death Differ. 14: 1985-1988. Yamanaka, K., S. J. Chun, S. Boillee, N. Fujimori-Tonou, H. Yamashita, D. H. Gutmann, R. Takahashi, H. Misawa, D. W. Cleveland. 2008. Astrocytes as determinants of disease progression in inherited amyotrophic lateral sclerosis. Nature Neurosci. 11: 251-253. Nagai, M., D. B. Re, T. Nagata, A. Chalazonitis, T. M. Jessell, H. Wichterle, S. Przedborski. 2007. Astrocytes expressing ALS-linked mutated SOD1 release factors selectively toxic to motor neurons. Nat. Neurosci. 10: 615-622.